Ortho-fused aromatic rings form helically shaped chiral molecules such as carbohelicene, that can be oriented in a left-handed (M) or right-handed (P) manner. The helical topology combined with extended π-conjugation provide helicenes with peculiar properties such as huge chiroptical properties and appealing photophysics such as circularly polarized luminescence (CPL), that make them interesting for applications in molecular materials. The molecular engineering of helicenes using organometallic chemistry offers a simple way to tune the chiroptical properties of these helically shaped π-ligand. We will present a set of representative examples such as for example as for example CPL-active iridahelicenes or redox-triggered chiroptical switches based on iron-alkynylcarbohelicene complexes. These molecular scaffolds behave as chiroptical switches responding to different stimuli (redox, acid-base, metallic ion,...). The tuning of the chiroptical properties, i.e. optical rotation, electronic circular dichroism, CPL activity, vibrational circular dichroism and/or Raman Optical Activity of these species will be presented. Jeanne Crassous received her PhD in 1996 under supervision of Prof. André collet (ENS, Lyon, France), working on the absolute configuration of bromochlorofluoromethane. 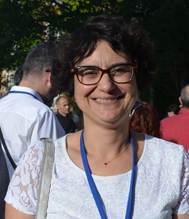 After a one-year postdoctoral period studying the chirality of fullerenes in Prof. François Diederich’s group (ETH Zurich, Switzerland), she received a CNRS researcher position at the ENS Lyon in 1998, and the joined the “Institut des Sciences Chimiques de Rennes” (University of Rennes 1, France) in 2005. She is currently Director of Research at the CNRS. In 2013, she became a distinguished member of French Chemical Society (Société Chimique de France, SCF). Her group is dealing with many field of chirality (metal-based helicene derivatives, chiral phosphorated π-conjugated systems and assemblies, fundamental aspects of chirality such as parity violation effects).